Occupying the tallest of Lisbon's hills, the district of Alfama brims with the feel of times gone by and is the truly emblematic part of the city. Largely spared in the earthquake of 1755, it is still a maze of narrow streets and steep steps, dimly lit taverns, flower-laden iron balconies and diminutive squares. Almost certainly the best way to see the wonders of this district, besides walking of course, is to catch the old fashioned number 28 tram which wends its way through the ancient streets and hills, rattling round tight corners and buzzing angrily at parked cars in its path. Its layout and name stem from the Moors for whom narrow, confusingly arranged streets represented a defence as well as protection from the heat of the sun. A sense of community and village still thrives here, although frozen rents over the years have meant that many buildings have fallen somewhat into disrepair occasioning a recent surge of investments into the area. Interestingly it is also home to a host of resplendent churches whose immense, beautiful structures tower protectively above the higgledy-piggledy clusters of simple tile-roofed houses. Historically the inspiration of many artists of pen, paint and film, Alfama has also provided the background imagery to many a nostalgic Fado song, and concerts are held in various establishments, although not as many as in Bairro Alto on the opposite hill. Given its lofty position, one of the recurring attractions of Alfama is the array of views one can find here. The glorious red suspension bridge, and rooftops of umpteen other districts, the majestic Baixa squares and the ultramodern skyscrapers of the uptown areas are all visible from various miradouros (viewpoints), not to mention the opportunity they provide to ponder the timeless charm of Alfama itself. On a clear day you can see right across the estuary towards the hills of Arábida. 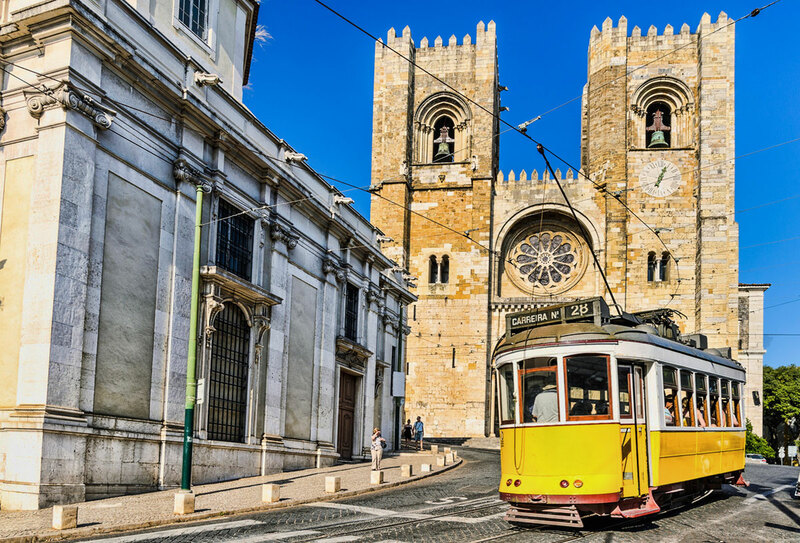 The most popular belvederes are those of Santa Luzia, where tiled murals show a pre-earthquake Praca do Comercio and the Christian siege of the Castelo de São Jorge in 1147, and the nearby Miradouro das Portas do Sol, where you can enjoy a coffee on the esplanade and visit the Museum of Decorative Art. 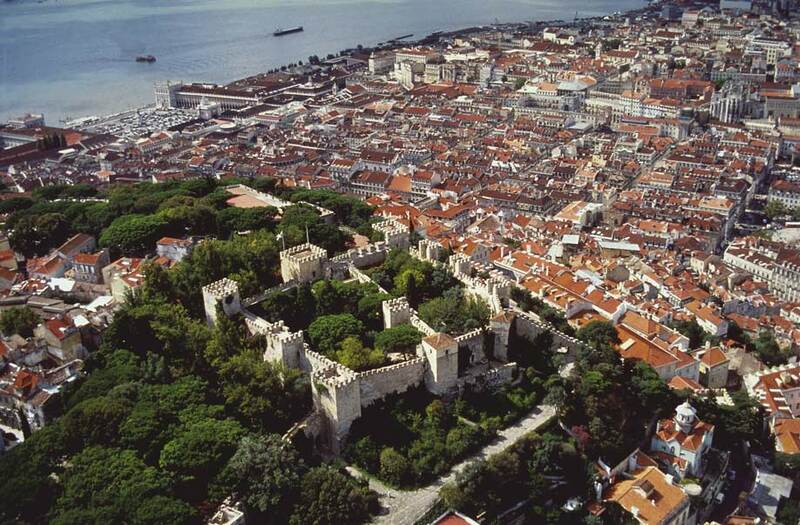 Crowning Alfama is the impressive Castle of Sao Jorge and the original buildings of the capital. Indeed, the São Vicente de Fora church built in 1582 owes its name to the fact that it was situated outside of the city walls (fora meaning outside) although it lies just down the hill. Thought to date from before the Romans, this fortification also knew Visigoth and Moorish occupation before being conquered by Portuguese King Alfonso Henriques in 1147. His triumphant, sword-brandishing statue presides over the main esplanade. St George, the English patron saint, provides the origin of the castle's name, stemming from a 14th century pact between the two long-established allies. 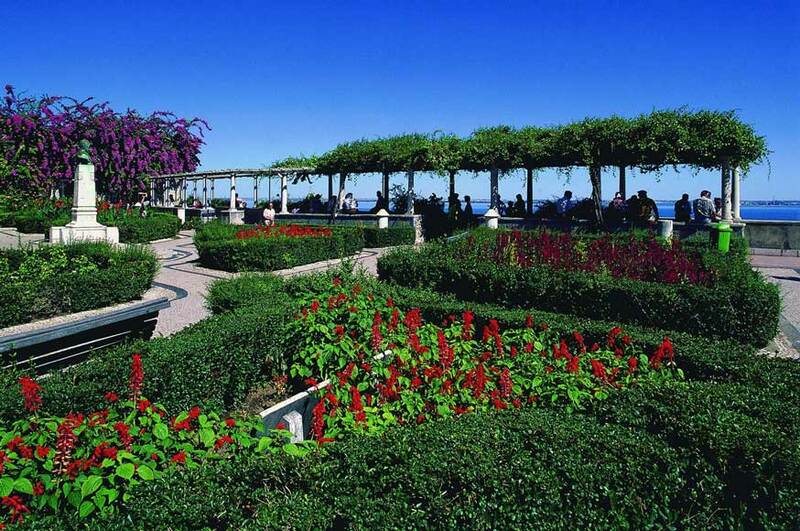 The peaceful gardens and walkways (some along the top of the ramparts) offer superb views of the city and river, and a tessellated map aids visitors to pinpoint landmarks. Halfway down the hill towards the Baixa is Lisbon's cathedral, the Sé, where a formidable and somewhat foreboding façade hides ecclesiastic beauty. Lisbon's popular saint, St Anthony, was apparently christened here and the 12th century font still stands, as does an impressive 14th century gothic chapel. Relics of the patron saint of the city, St Vincent, were kept here but lost in the 1755 earthquake, which damaged the cathedral quite extensively. Its Romanesque cloister, sacristy containing assorted treasures and various examples of decorative stonework are all worthy of a visit. Reputedly, in the14th century a bishop was thrown from one of the twin towers by an angry crowd disapproving of his Spanish origins. Perhaps aesthetically more striking is the church and monastery of São Vicente de Fora, positioned on the Graça side of Alfama. Following devastating damage during the earthquake, the monastery was rebuilt and partly transformed into the final resting place of all Portuguese kings from the 17th century to the demise of the royals in 1910. This pantheon also contains the remains of Catherine of Bragança, Portuguese wife of English king Charles II. The roof terrace offers yet more spectacular views, and the copious tiled friezes which decorate the interior are particularly illustrious. Nearby, more important tombs, this time of prominent Portuguese figures and heroes, lie elegantly in the National Pantheon; the Igreja Santa Engrácia. 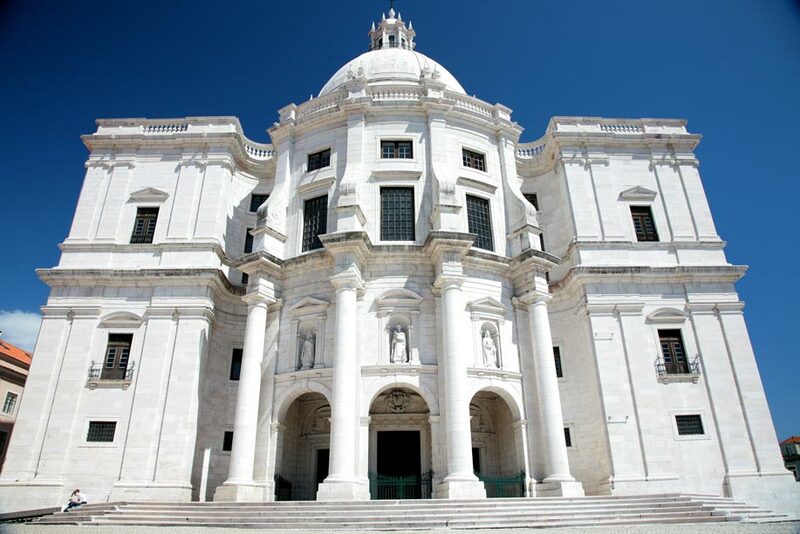 Finally inaugurated in 1966 after centuries of reconstruction, this gleaming white edifice is built in the shape of a Greek cross and topped with a dome offering 360-degree views of Lisboa. Amongst those entombed here are the Fado diva, Amalia Rodrigues, past presidents and various writers and poets. The area outside the church hosts the city's flea market, the Feira da Ladra ('thief's market'), every Tuesday and Saturday.